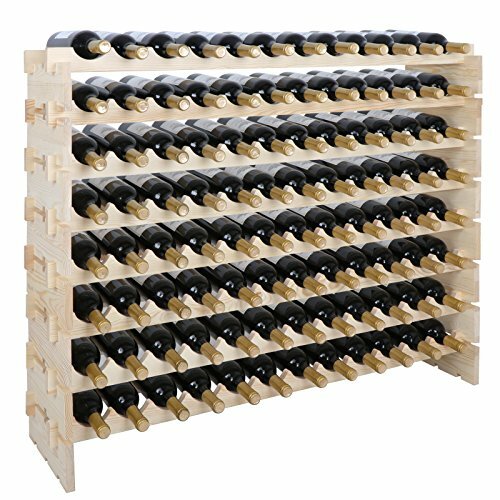 This 96 Bottle Wine Rack from Smartxchoices is crafted from premium quality pine wood which is sturdy and long-lasting. It has a huge capacity of effortlessly holding 96 wine bottles. This eco friendly wine rack can be easily floor mounted. The efficient design of the modern wine rack ensures that the wine bottles are stored in a organized manner. 【Thoughtful Design】Versatile modular stacking style,wave shaped shelves,arc design prevent wine bottles scattered around dowel pins to inter lock each connection point. Unfinished wood gives option to stain, paint, varnish or leave as it is. 【Overall Dimension】Approx.47"(W) X 11.4"(D) X 37.2"(H). Holds up to 96 bottles (8 layers & 12 bottles each layer), Spacing between bars of wine rack is 6.3'', will hold standard size wine bottle (750ML). This wine rack holds all different sizes bottles, top tier could holds your favorite champagnes! 【Excellent Wine Rack】 Classic design to accent any home, kitchen, dining room, or wine cellar. Also makes a great gift for any special occasion. Wine collectors will definitely love this wine rack!